They just go over the hard top canopy of the golf cart and fasten down, like a golf cart condom..... People use that with a homemade top frame as needed for a cab on there compact tractors.... Some fit real nice, others are at best OK.... I suppose I should go to the tractor thread with this info ?? I got lucky in finding this one. The smaller covers usually run from $100 to $150, but my cart has a longer roof. The best I'd seen at any golf cart sites was around $250. But one ad I found for $245, had a spot at the side of the ad that said also available at these sites, and it listed Wal Mart. Sure enough Wal Mart has it where it can be bought on line, and the cost was $144. So I saved $100 off what I thought I was going to have to spend. It is designed for a golf cart, so I had to tuck it between the seat and the back bed. I can still open the window on the back if needed but I doubt I'd need to do that. The window is there so you can pull out a golf club, and I'm guessing this cart won't be seeing any more golf clubs. Due to the workload at the Property, my scouting and grouse hunting seems to have hit a many year low. Kind of "funny" as the time I've spent in my hunting area hit a all time high. Finished my load work with the 30-06, loading shells for the season and shelf. Sounds like the grouse population was pretty low this year, even though drum counts were up over 30% this year. The most grouse I saw were those around my camp, heh. I'll be sitting my ladder stand that I was in last year, but moved the portable looking over a high grass flat near the river. I figure I'll sit the ladder for the first two days, get bored, transfer down to the river for a different view. Oh, my hunting Buddy found an area where he kicked up alot of snowshoe hares. I think I will definitely have to check that out for mid-winter hunting! They say a slight increase in Wolf population from 2013, but insignificant. I will make some observations by the end of the rifle deer season. The last weekend I roam more, and there usually is snow on the ground. I walk the same areas every year, and will get an idea based on tracks. Thanks for the idea about yote and the rabbits - if there is a high concentration in the area mentioned, I may have to hunt them more this year. 900am I see a doe walking down the trail that I look over, which goes through a nice small opening with ash and tall grass. She stops and nibbles a couple of saplings, then moves on. 905am I see a second deer that appears to be trailing the doe. I see two body flashes as it moves through 5-6 year thick aspen growth about 50 yards past the trail and 3\4 of the ways up a small rise. No view of the head, but a big body. 910am I slip my hand into my open backpack that is tied to my ladder stand, and pull out one of those doe bleats in a can. I hit the call about 4-5 times in the space of 5 minutes, put it in my lap, and slowly grab the rifle. 915am The deer starts coming down a small trail that connects with the main trail. I see horns and the top of the back as it wanders down. Pretty much walking straight towards my stand. He gets to level ground, looks up, presents a nice straight shot to the neck. I take the shot, and he drops in his tracks. The shot entered the neck just above the shoulders, hitting the windpipe\jugular, through the heart and exits the middle of the ribcage. 8 Points, with one under developed point and one that had broken off early - close to 10. Dressed out at 170 lbs. Rifle was the Tikka 30-06 with the hand loads that I describe in my other reloading post. When walking to the stand, had an absolutely beautiful view of Orion pointing towards the Moon. I considered that a good omen. I'm 2 for 2 when hunting my property - I consider this just another blessing that this land is where I want to put my final roots down in. Nice deer, and lots of good eats. Our rifle starts next Sat. With temps all this week and next 20 degrees below normal, they should be moving good. Just going to be a little colder on the stand. Are you allowed to take more besides the buck? Here the state allows for 2 bucks per person, but we've self imposed a 1 buck limit on the ground we hunt. Doe permits are almost limitless, but again with our EHD a couple years ago we go light on the does too. We are only allowed one buck in the Zone that we hunt. However, there are bonus tags for the Metro TC zone - could always bow hunt that area for more venison, but typically we get enough Bucks Up Nord to satisfy our needs. Oh - and good luck this weekend, Hunter88 - looking forward to hearing how y'all do. We've been going at it all this week with archery. My buddy missed a doe the other day and couldn't quite get a shot off and a mid sized 4x4 this evening. We've just hunted evenings since it got cold. 20s isn't real bad to be in a stand, but that 5 to 10 in the mornings with 15 to 25 mph winds is a bit much. Looking forward to switching to the rifle and moving to the stand with the heater. They say a little snow on opening day so that will be nice. We usually don't have snow during rifle deer season. Wolves, Wolves, and more Wolves. This is the last weekend for firearm deer season. and we've still only put one buck on the pole. We have a good amount of snow cover, and this is the time when we do a lot of pushing and still hunting. We always see more wolf sign during this last weekend, but what we have been seeing this year is absolutely incredible. I have not walked a single area where there isn't a lot of wolf sign. Every time I walk an area, there are tracks crisscrossing everywhere. Also, a lot of ground scratching and urination marking boundaries. We used to see this very rarely. Now, it's everywhere. In the past, I've always had an attitude of "live and let live" when it comes to wolves. I respect them, they are fellow hunters. This year, my attitude has changed. Next year, all of our party will be putting in for wolf hunting permits. We won't trap, but if we have a permit, we will shoot. I have a couple of pics of ground marking which I will post up shortly, just a little lazy at the moment. Last edited by Kachad; 11-23-2014 at 09:36 PM. Well rifle season was a cold hunt for sure. At least by our normal standards. Passed on a lot of small bucks, but I still have a chance there. My permit is a landowner permit, it goes from Sept to Jan, and you use whatever weapon is legal for the time you are hunting. So basically I used the same permit for archery early, used it for rifle last week, and starting next week I can use it for black powder or archery. I'll stick with black powder for the month of Dec. There are four of us that hunted the last couple weeks. 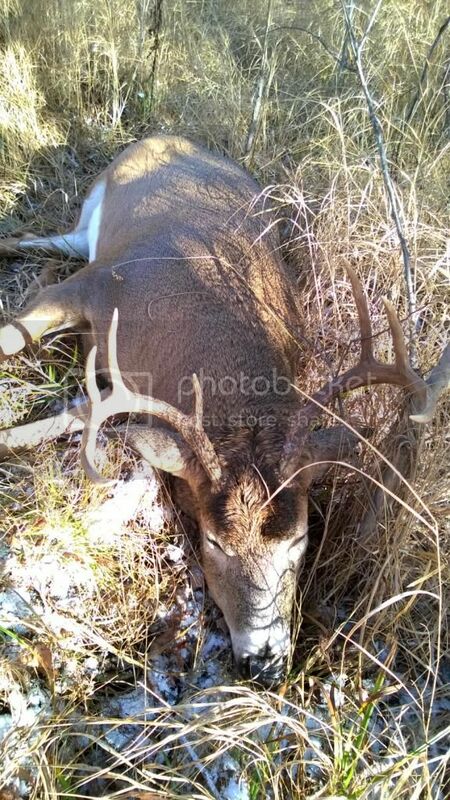 My son in law took a nice 6x6, and then the next day had an even bigger buck walk under his stand. But if one has hunted long enough, he knows that's just how it usually works. On the last evening of rifle there was three of us out and since we wanted some meat we took 4 does. I our case no matter who shoots what, we always split everything 4 ways. We buy whole briskets from Wal Mart and add that to our lean venison for hamburger. So far each guy has gotten 30 pounds of hamburger. When we take into account the cost of the brisket our hamburger comes to about $1.25 a pound and is about 90% lean. We've also put about 30 pounds of ground venison into the freezer that later will be turned into summer sausage. And we gave two of the does to the guy that lets us hunt his ground so he can give them to his hired man. Since I have to do Thanksgiving dinner for about 15 people, I'll take this week off from deer hunting to concentrate on cleaning the house and getting things ready. Then on Dec 1st I'll start back up with black powder. I smoke the turkey Wednesday, and if I get it done in time I'm thinking of taking the predator call out about sundown and see if I can get one of those coyotes that are around to come in. A guy can't just stop hunting cold turkey. Oh speaking of turkey one morning while my buddy was sitting in the enclosed stand with me we had about 15 hens and jakes come in. He had his bow that day so I told him to take a turkey quick. Let's just say after he'd run out of arrows to shoot we were still able to sit and watch the turkeys. I set up a rabbit decoy on The River and was able to call in a Yote. Took a shot with it running, but missed. I'm sure if The Old Man took the shot, he would have hit it. Old Dead Eye, for sure. Feb is the best month for yote hunting here, and I expect to have some time in the field. Any suggestions for practicing running shots? Thanks for the ideas about the balloons. That sounds pretty practical. Camo - I don't think the yote saw me, I think he was just rocketing towards the decoy. My camo is pretty good, but I think I do need to work on personal movement. I don't think the yote saw me, I think he was just rocketing towards the decoy. Last edited by Bearfootfarm; 01-24-2015 at 08:28 AM.